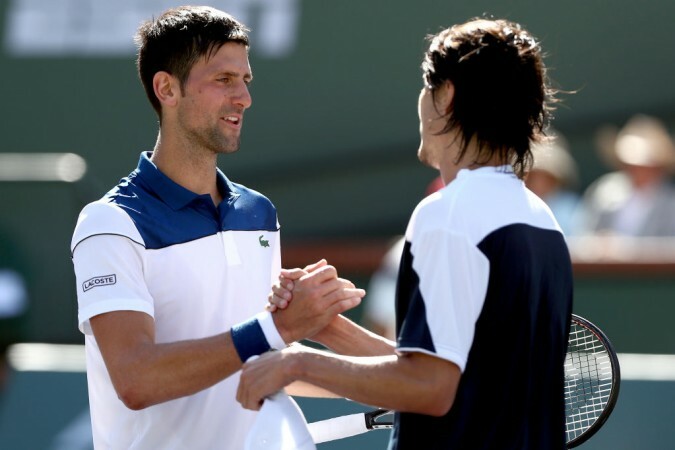 Comeback man Novak Djokovic was stunned in three sets by lower-ranked Taro Daniel in the second round of the BNP Paribas Open in Indian Wells. Former world no. 1 Novak Djokovic said he felt "weird" and acknowledged he "completely lost rhythm" during his second-round exit at BNP Paribas Open — the ongoing ATP Masters 1000 tournament in Indian Wells on Sunday, March 11. Djokovic was stunned by world no. 109 Taro Daniel of Japan in three sets — 7-6 (3), 4-6, 6-1 at Indian Wells. The 12-time Grand Slam champion was playing his first competitive match since recovery from a wrist injury that hampered his Australian Open campaign in January 2018. The Serb underwent a "small medical intervention" on his troublesome right elbow last month and made his recovery ahead of schedule. A lot was expected of Djokovic, but the Serb was rusty and made 61 unforced errors in the match against Daniel that lasted two hours and 30 minutes. He pulled it back in the second set, but was blown away by the Japanese youngster in the decider. "Very weird. I mean, I just completely lost rhythm, everything. Just struggled also a little bit with the health the last couple of weeks. For me it felt like first match I ever played on the tour," Djokovic said after his defeat, as quoted by ATP's official website. "I was grateful to be out on the court after surgery that quickly. But at the same time, I just didn't feel good at all," he added. Djokovic revealed his underwhelming performance on Sunday was more of a mental issue than anything else. Nonetheless, the Serb said he was happy about the quick recovery he had made from his recent elbow issue. The 30-year-old, who was involved in a two-way battle with Andy Murray for the year-ending world no. 1 spot in 2016, was forced to cut short his 2017 season due to persistent issues in his racket-swinging arm. He skipped competitive action following his withdrawal from Wimbledon quarter-final against Tomas Berdych. "Obviously having only played a couple of matches in nine months, you are still, in a way, battling inside of your mind whether you are fit or not. And even though you don't have pain, you are still thinking about it, because it has been something that I have been feeling and dragging for over two years," Djokovic said. "I am just happy that I managed to recover that quickly after surgery and just get out on the court. I was not even supposed to be here because of the surgery that was only five, six weeks ago. But I recovered very quickly, and I got myself ready," he added.